Melbourne Music's 2010 calendar is all about getting some pretty fresh ideas up and out there all in the name of nurturing our local talent. Events ranging from an awards ceremony for independent bands, to live street performances and stage musicals will run all throughout the city. Literally moving amongst the festivities, for his Live On The Tracks tram performance, will be none other than Justin Heazlewood's side-splitting alter-ego, The Bedroom Philosopher fresh off his Songs From The 86 Tram tour. He and his band of mis-fits known as The Awkwardstra will be emerging from the bedroom to share their particular brand of philosophy with Melbourne's commuters on board the 86, 96, 112 and City Circle trams at the request of Metlink and Yarra Trams. 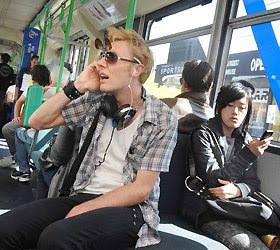 Before Justin packs his guitar, public transport meanderings and gold-plated Myki and heads off to the station, he discusses iPods, private loos, dead chooks and owning his new tag. "I guess I turned myself into the poster-boy for public transport, so it seems logical I'd get the call to do this." Justin shrugs. "I was the obvious choice, wasn't I?" He adds cheekily. "Also I think Melbourne really needed another festival, things were getting a bit dull around the place, so it's nice that people will finally have something to do for a change." Comparing live music venues to trams is a long stretch, but Justin happily runs with the notion. "I see it as a bit like The Tote crossed with a rollercoaster," he smiles. "People seem to be able to source alcohol pretty easily and it's got pretty good opening hours. The only downside is I won't be getting a curtained off area or private toilet, alas." Justin adds. "Also I'm gonna have to get used to people leaving during the gig, without taking it personally. My hope is that people find it so utterly captivating that they stay on board all the way to Bundoora." It's here that Justin prompts a possible concern that he'll in effect be competing with the scourge of public transport – the iPod army. So what plans does he have to distract his audience from their world of mp3 entertainment? 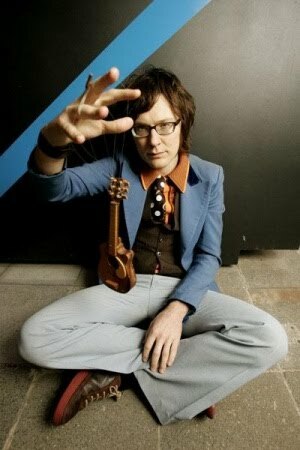 "I was thinking maybe everyone could download my album to their iPod's and listen to it while I mime. I think that'd be quite a good post-modern gesture." He giggles. "Also because each track on the album corresponds to the suburbs the tram travels to, it'd be great if those actual characters from the songs get on the tram at the right intervals creating a kind of living film clip." The city tram is of course a haven for budding musicians in search of a captive audience – the singing driver has struck on many a visit in my own travels, not to mention the odd overzealous busker down the back. So what, I wonder, are Justin's thoughts on impromptu Awkwardstra wannabes? "Actually I'm really looking forward to the Smith Street leg of the journey – there's always the chance some dude with a harmonica might jump in, but in reality, we're a pretty reserved bunch in Australia." He pauses. "Whenever anything slightly unusual happens on a tram people tend to bury their faces in their books, so I hope that the good old combination of comedy and music will help ease some of that tension." Justin, in standard Bedroom Philosopher mode, continues on a sharp witted analogy most commuters could surely identify with. "I think tram travel as like a detention for adults." He muses. "For ten minutes you have to sit in this room with other people you don't know and think about what you've done that day. I'm not saying it's a bad thing really, I mean they're pretty safe places to be when you think about it. It's not as if someone's gonna go nuts and hi-jack the tram and go for a joyride to Canberra." He adds in a mock aggressors tone; "We taking over this tram – we're going to Bundoora and then to docklands and then back to Bundoora again… And we're gonna keep going back and forth until our demands are met!" Only at this point is there even a hint Justin's about to crack himself up. To get back on track, he bullshits masterfully about a cinema great that never was. "Did you know the original draft of Speed was set in Australia on a runaway tram?" He adds casually, "Only the bomb was set to go off if the tram went over five kph." He further reveals, "The psychopath was going to be played by Yahoo Serious, with Bill Hunter and Georgie Parker as the protagonists." 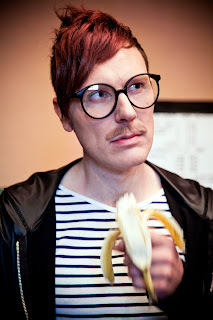 Apart from re-casting trashy half-imagined films, through his recent single and video Northcote (So Hungover), Justin essentially revealed how he likes to spend his time on a long tram trip - by casting himself as the as a tragic hipster making his way home from the "Fitzroy Anti-social Club". I question where his well honed fly-on-a-wall interest stems from. "I just find people watching endlessly fascinating - which is probably a bit creepy - but I wouldn't have written half the material I had if it weren't for many years absorbing people on a daily basis." He adds. 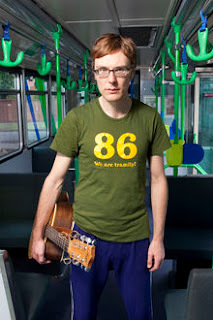 "I see the trams as a kind of free theatre and as an artist it's a really good resource to tap in to. Plus you get to hear the best stories." He recalls. "One I heard that sticks in my mind was about a woman who apparently got on board with a live chicken and the driver said she couldn't bring a live animal on the tram, and so thought about it for a sec, and just broke it's neck!" People watching can be a hazardous activity. I'm sure most of us have played a rousing game of 'trying-not-to-get-noticed-by-the-crazed-drunk-bloke', but Justin claims, despite his cracking commentary on Songs From The 86 Tram, he's not there to judge. "The thing is I am wary of becoming this retro bohemian looking down from his ivory tower, but the tram is a really equalizing arena I think. People kind of use the space for their own purpose in a way, whether it's to tell their life story to a stranger or break a chook's neck, everyone's on even ground I suppose." He adds thoughtfully, "I guess I am guilty of using it to my advantage as an observer and songwriter but its all relative really." Melbourne's trams certainly are fertile places for the imagination whether you're faced with little stimulus or grabs of overlapping conversations and colourful behaviour. If you're along for the ride, you'll find yourself among the company of slumbering/observing/participating/judging commuters not unlike yourself. Justin, naturally enough has a final philosophy on the topic. "I think it's important to remember, you can never really know a man until you've sat a mile on his tram line."